The Regions Visa Business Enhanced Credit Card currently has an Informr score of 3.6 out of 10. This score is based on our evaluation of 1 sources including reviews from users and the web's most trusted critics. 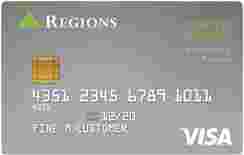 Regions Visa Business Enhanced Credit Card is typically available to those with excellent credit scores (650 or greater). The biggest disappointment with the Regions Visa Business Enhanced card is its surprising lack of benefits. Credit card benefits that have become standard on credit cards, such as travel assistance and car rental insurance, are conspicuously absent on this business card.